Here's a quickie tutorial for some fantastic mini charms we'll be making at Art Camp for Women, during my class Tempest in a Teacup, October 13-15, 2012. This will be my only teaching gig this year, so I'll be putting all of my energy into insuring that everyone absorbs a whole heap of inspiration. Camp will be about self-exploration and getting to know ourselves through our likes, loves, self-admonitions and the roles we play purposefully and by chance. I promise a transformative time together. We'll use these mini doodle charms to adorn our tempest quiltlet, but you can use them for jewelry, fabric art or anything you want to spice up with some colorful bling. 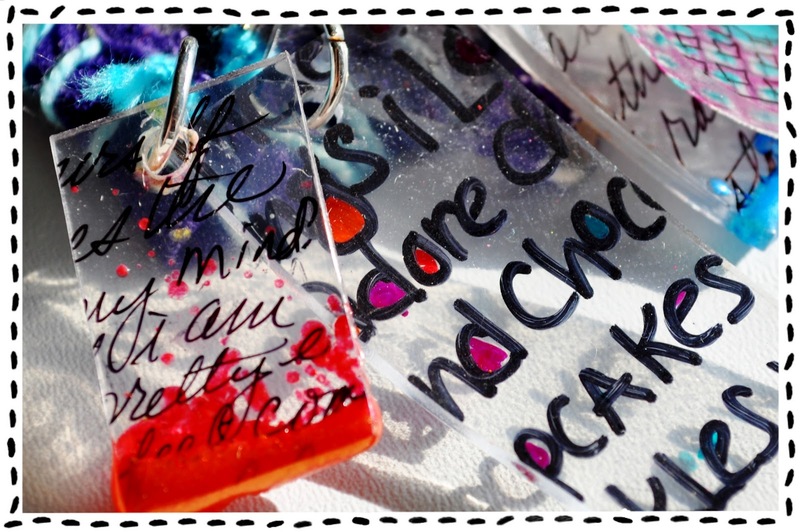 I'll show you two distinct charms: journal charms and doodle charms. Gather up the following supplies: Shrinky Dinks - clear and frosted sheets; scissors, Sharpies - fine black and brights mixed, colored pencils, hole punch, teflon sheet, heat gun (or you can use your oven), embossing powders - (UTEE is especially nice), jump rings, jewelry pliers. Let's get started. JOURNAL CHARMS To make some journal charms, use a fine black Sharpie and the clear sheet of Shrinky Dinks. On one side of the clear sheet, journal about things you LIKE. You can write using printing or cursive writing. Whichever you choose, leave lots of enclosed areas in your letters, because we'll fill them in with color. Just write whatever comes into your mind. We'll cut this up so no one will see the full sentences--just the snippets. "I like clouds that are big and fluffy white in a deep blue sky..." What do you like? Once you've journaled your whole page, flip it over and fill in the enclosed areas (loops and circles within letters) with all of the colors of Sharpies you have. Take turns using the different markers until you've filled in all the loops. Make sure you're coloring in on the opposite side of the clear sheet so you don't smear the black Sharpie. It's disorienting, I know, but you can do it! Once you've filled in all the loops and circles, you'll have a fun and fancy journal page! Now, cut it up into rectangles. Mine are about 1.5" x 3", but you can experiment. It's not science, just play. Punch a hole in the top so you can add a jump ring later. DOODLE CHARMS To make the loves mini doodle charms, doodle some images of things you LOVE on the glossy (non frosted) side of the frosted Shrinky Dinks page. Again, this is going to be cut up, so don't worry so much about context or drawing skill. Just go for it! Simple is better. I love clouds, cupcakes, hearts, flowers, pencils, spools, pie, city scapes and etc. Fill in the blank spaces with swirls or dots or leaves or whatever strikes you. Don't leave much space between drawings. Flip the sheet over and use your colored pencils to color in the backside of the drawings (coloring on the frosty side). Mix and mingle your colors to blend them. You don't want to spend too much time on this, as some of the drawings will be lost when you cut your charms. Fast and loose! It's time to cut again, but this time cut out some circles if you're daring! Ovals will work too. Add a hole with your handy hole-punch, so that you can adorn them with jump rings. Here's the tricky part. Let me show you how I do it, because I am too impatient to wait for the oven to heat up. Place the cut outs one at a time on a heatproof surface topped with a teflon sheet. Use a heat gun to heat it up until it starts curling up and shrinking. It's gonna get crazy. It will go through little spasms (picture the wolfman transforming under a full moon) and roll around. Chase it with the heat gun until it unrolls and lays flat. This is what it will look like when it's done. Flat and pretty! You can see here some of the crazy forms it will go through while morphing. Don't worry, this is normal! Here's the caveat. Sometimes you'll lose one of these little gems. It will roll up and stick to itself and no amount of wailing will save it. The Shrinky Dinks will have an oven method listed on the package and it will work like a....uh, charm! If you choose to shrink them via the oven method, put the teflon sheet on a baking sheet, lay the charms on the teflon and bake. The Shrinky Dinks get very shrinky. Here's the difference between the journaled page cutouts and the final charm. These little guys are chillin' and ready for the SECRET INGREDIENT. The SECRET INGREDIENT makes them sizzle, pop and zing! You guessed it, we're gonna add some UTEE (ultra thick embossing enamel) or embossing powder. Whatever color you have will be divine. Simply stick a skewer through the hole in your charm to hold it in place. You'll need to fire up the heat gun (the oven won't work this time) and heat the bottom edge of the journal charm. Just enough to get the UTEE to stick. Dip the edge of the heated charm in the embossing powder. Reheat and dip again to add some sparkle to the bottom edge. If the UTEE does not stick the first time, keep running over it with the heat gun hold the heat gun a good inch away from the charm) and re-dipping until it sticks, then dip again. You can try dipping in more than one color if you want to get fancy. I always want to get fancy! Don't forget to reheat the embossing powder once it's on the charm, so that it gets nice and glossy. Voila! Your finished charms should look something like this. Add a jump ring so that you can dangle your charms on jewelry, mixed media and the like, or use waxed linen cord or string through the hole to tie them on. Visit the Art Camp for Women site, click on the FAQ's tab and find out 10+ Ways Art Camp for Women Differs from the other Art Retreats. While you're at the Art Camp site, look for the link to their newsletter. There are monthly prize drawings and free journal prompts galore. What a fabulous tutorial. I've never used Shrinky Dinks, but you have given me the inspiration to give it a try. art camp, but Im a bit far away. this looks like so much fun. I've never seen Shrinky Dinks where I live, I would love to get a chance to play with them. Thanks! Michaels sells it and food containers like sandwich containers, and bakery containers made from clear heavy plastic is the same material, just sand for frosted shrink art and cut up your packaging as you eat your pastry. I played with shrinky dinks when my son was a little fellow - he is now 43! What a great opportunity to once again explore this craft technique with this give-away. Thanks for the opportunity to put my name in the hat. I agree with Erin, I've never tried Shrinky Dinks but your tutorial makes me want to run out and get some! Thanks so much for sharing this technique!! I have always loved Shrinky Dinks! Gonna hafta go out and find some of that plastic now. Thanks for the tutorial. Your tutorial was great. I imagine everyone is going to love your workshop. Thanks for doing this. This brings shrinky dinks to a whole new level! Thanks so much for sharing the tutorial as well as the opportunity to win one of these fabulous kits!!! So much inspiration! So whimsical! I can't wait to try it out (-: I'm sure it will bring back some childhood memories (-: Thank you for sharing! Kelli, I love these charms! And I have Shrinky Dinks.... guess what I'll be trying soon? Thanks for the chance at a gifty! wow! Fun! I can't wait to try these for my book club friends. Thinking of adding beads and making book marks or something like that! Great and fun idea! Wish I could go to the camp. I live on the east coast, so it is a haul to get out there. Maybe next year! THank you for sharing FREE of charge a tutorial! Hi An; Stitchpaper is what I call paper/cloth or cloth/paper...it's what my book Stitch Alchemy is about. It's a base of muslin topped with collaged papers and then decorated so you can use it in sewn projects or paper projects. Great stuff! Thanks so much for the tutorial. I love shrinky dinks and your tutorial just adds a bonus!! OMG - this looks like so much fun! If I don't win the kit, I'll have to go out and get the supplies. Thank you for the tutorial. I have made lots of charms using this technique. You are so wise to show people how they go crazy in shape while they are melting. I usually use a skewer or pick to keep them flat while in this stage (or at least keep them from sticking in a tight ball). I have stamped images with Archival Ink and watched them get super small. Thanks for the great idea Kate! Okay everyone---hold the shrinky dink down with a skewer while you're heating it and you can avoid the errant rolled-up ones. Fantastic! So cute! There are so many possibilities too! I have never used my heat tool to do this. Thanks for the great tutorial! I absolutely love these! It's been a while since I made charms with SD, so looks like I'll have to get some more and do it. I've also used the heat gun and it works great and fun to watch. Thanks for the tut and the opportunity to win! My nieces are coming for a visit next week and this is the perfect project for us to do together! Thank you for the inspiration! And thank you for offering the giveaway! These look like such fun~thanks for the tutorial! thanks for the chance to win! oooh! A few weeks ago I dug out a very old sheet of shrinky dink to show my 8yr old and she went to town using rubber stamps, markers and colored pencils. Thanks for demonstrating more techniques - the fancier the better! Would love to win your giveaway - thanks for this opportunity! Ah, to be able to spend a day with Kelli and absorb all of that juiciness! Something to dream about! Can't wait to make these charms and fashion a new bracelet! Thanks! Love your charms, what a great tutorial I plan to create some myself. Wow, this looks like so much fun. I can't wait to try it. I remember when shrinky dinks 1st came out. A great little tutorial as usual...and I have been eyeing Art Camp for Women! These are so cute! 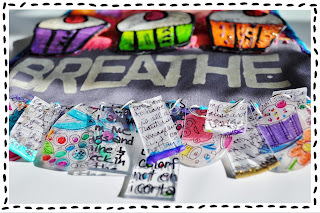 I've used UTEE on shrinky charms with my teen students before, but I love the idea of having them write journal entries on the shrinky plastic to cut up into charms. FUN! We like to add rhinestones into the UTEE while it's still warm -- I got a bunch of the heat-set kind meant for tshirts and they work really well unless you bake them with the shrinkies then they melt. haha! This is so fun. I used to love shrinky dinks as a kid. I have to try this. Now to jump to Art Camp for Women and check it out. Thanks for the inspiration! I love this tutorial, thank you. I haven't seen shrinky dinks in Austalia. I must go searching for them. LOL! I love it. What a great excuse to play with Shrinky Dinks. My nephews are visiting and I've been getting them into mixed media. They will love the idea of dangling, jangling embellishments that they made themselve. Thanks for the idea! Great tutorial... I had used shrink film years ago and forgot about it. Need to try some again, love what you have made with it. I wish I could go to your class.... was going to try but to much stuff going on right now. Have a great time! Love this tutorial! Will definitely be making some of these! Looks like fun I would love to attend the camp. Would love to win too. This tute is great. Thanks for the good pics too! I have tried shrinky dinks years ago and they would never lay flat. I guess I needed to be more patient. I would love to have a chance to go to Art Camp but life is too busy and money is too tight. I will keep it as one of the bucket list things! this will be really fun to try and I would love love some of your stitched paper--it is fabulous! OMG! That looks like so much fun and a have lots of sharpies! Thanks for the inspiration. Would love to win your pack. I was in the middle of working on a project when my email dinged and I distractedly ended up looking at Google Reader. I saw your craft and was SO excited I dropped everything to look for my Shrinky Dink paper. Thanks so much for always inspiring me to immediate action. I'm a HUGE fan!!! What a great idea - I'm inspired! And thank you for the doing the giveaway. What a fun use of shrink plastic - thanks for sharing the great tut! Love your work, love this idea, and would love to be entered for the drawing! Been a fan of yours forever! Please enter me in drawing! Please enter me in the drawing. The kit looks like so much fun! Thanks! Thank you for the tutorial in making the charms; please enter me in the drawing. You put together a fun assortment! I tucked away a stack of Shrinky Dink plastic years ago...I think it is time to bust it out again for this awesome project! Thank you for posting this tutorial! Please enter my name in the giveaway! As a child of the 70's, I ADORE Shrinky Dinks, and I remember my mom and I making all kinds of fun charms with them when I was a kid. I've done them with my kids now, but I really love your journaling ideas. Looks like I might have to get the Shrinky plastic out today! Looks like a lot of fun! Have to try it! Thanks for the tutorial. What an awesome tutorial. I love all the pictures. Thanks! In all honesty that is one of the coolest tutorials I have seen in eons. Wow. They rock! I really want to try to make those charms. Honestly, my first thought when I saw these was "ugh, I don't want to make these. It's just one more thing to do that I don't have time for (like playing around on the computer this morning is a good use of time - ha!) I'm not going to read it" but then I was magically sucked in and I started reading and now I WANT TO MAKE A WHOLE BUNCH! Not sure that I can wait to win this, so it's a good thing I have a great coupon for the craft store! THANK YOU!!!! Wow, fab tutorial. It makes me want to get my shrink plastic out right now. Don't think the rest of the office would be very impressed if I did! I'd love to be entered for your draw, thank you! Love this tutorial! Thanks so much. We love Shrinky Dinks in my house, (and Sharpie markers too, actually). These charms would make great gifts for teachers and friends. I can't wait until my daughter gets home to show her this fun idea. I love how you use the shrinky dinks! Your art is such an inspiration! This looks like a great activity to do with my grandkids. Thanks for the tutorial. Great tutorial. Hope to win some of these. Looks like fun. What a fun tutorial - I am thinking of doing this with my kids!!!'. Thank you for the giveaway!!! Awesome tutorial! I've had some of these sheets forever and I will finally dig them out and give them a try. Thank you so much! 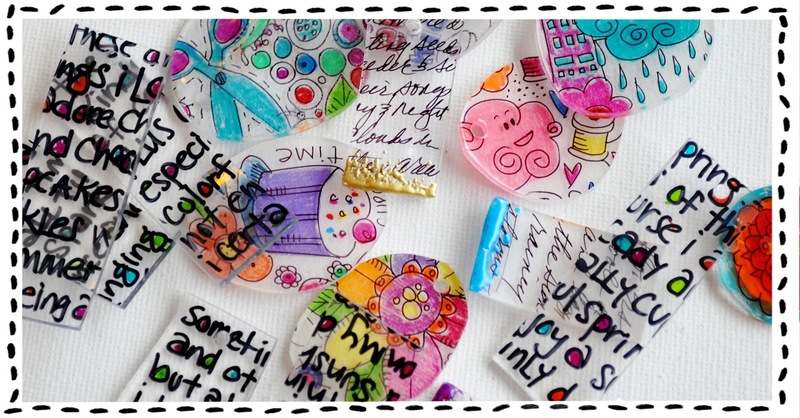 It looks like great fun playing with Shrinky Dink! And even more fun @ the Art Camp! I'm going to visit their site next to some exploring - maybe see you there! I stumbled on the Sketchbook Challenge and each day the email updates with submissions (like yours)are the highlight of my inbox. They are inspiring in their own right. I want to run away and play with shrinky charms immediately after finishing this post. Wow, great tutorial! This has opened up a whole new crafting concept for me! Thank you for this, and the giveaway! Thanks for the tutorial and inspiration! I am ABSOLUETLY going to make myself show shrinky dinks.